Fabric Mart Fabricistas: Made By A Fabricista: The Skirt That Should Have Been Pants! Made By A Fabricista: The Skirt That Should Have Been Pants! So, here I am sharing with you a project that did not go as planned.. but I could hear Tim Gunn say the entire time "Make it work".. so I did! We all have projects that don't go as planned. Sometimes I feel these projects are good because they challenge our creativity. I am happy with the skirt, the only thing I don't like is the center front seam. If I were to draft this skirt from scratch, I would have only two front darts. I styled this skirt with a black tee and snakeskin pumps and tassel earrings. My daughter picked these earrings out for me last weekend. Aren't they so happy? So now let's talk about this project. I started out making a pair of pants. I was convinced these would be the cutest pair of pants and that the fit would be amazing? Why?!! Because the pattern envelope told me so. Maybe it was overconfidence or my optimism (that's what I chose to believe - I'm just always thinking positive haha ). I seriously expected to sew up these pants, do one alteration and end up with a fabulous fit. Boy, was I wrong. If you have had the same experience with this pattern, do share. The pants seemed extremely high waisted, and also very long. (I am 5 feet 4 inches) This was the longest crotch ever. I knew right away that this could end up being that projects that got very frustrating very quickly. I heard my inner critic say "You should have made a muslin". Anyways, the reality was, that I did not make a muslin. I was still so in love with the fabric, I wanted to salvage the project. The only thing that fit me on the pant was the waist, so I decided to turn the pants into a skirt. I had to take in the side seams, back seam, and front seam in order to get a better fit. I do love these pants so much. I am going to attempt them again, but next time I am going to make a sloper. The fit is amazing on Mimi G.
Beautiful skirt! I have this pattern but I have not made any pants yet. I need to get have the fear of messing up and just do it! Great SAVE!! I would have probably just dumped it and call it a day, not knowing that you can create a pants. Thanks for sharing. Great save! 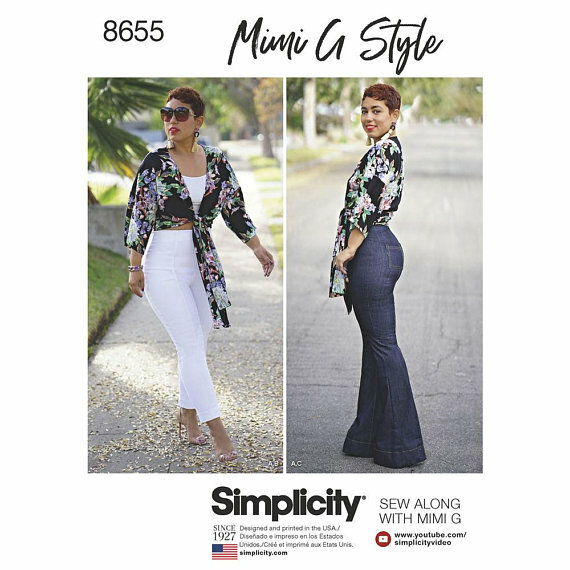 I have a few of Mimi's pants patterns but haven't tried them yet. Hers always look amazing! I too will be creating a muslin for any of her pants patterns--or any pants pattern! Love your skirt! I always enjoy your posts!